These puppies are all the rage in the crafty/quilty community these days. AND while I’m not generally one to follow trends (aww, who am I kidding, I love trendy things! ), these are SLIGHTLY addictive. I’ve made three and there isn’t an end in sight! I’m so proud of myself!! I tried all kinds of new techniques making these. The projects were small enough where I felt comfortable stepping outside of my box and dipping into a new bag of tricks. I tried a new embroidery technique, fusible applique, machine binding and a new quilting process. I hope that everyone is going to love them as much as I do! Now, because all three are in transit to their new homes, I can’t divulge all the details, but here’s what I can share. The first is for a wonderful bloggy friend. 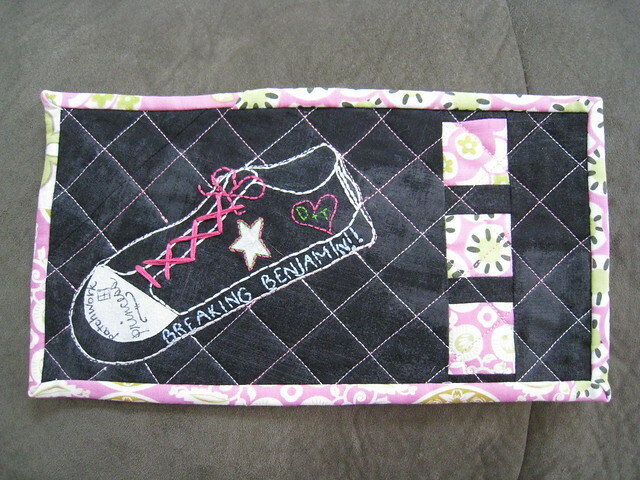 She’s a rockin’ patchwork princess that loves Breaking Benjamin and her good ol’ Chuck Taylor’s. My dear, sweet husband helped me out by drawing an All-Star Converse shoe (you would be rolling if you saw my attempts at drawing) and off to embroidering I went! It makes you feel a little like you're back in high school, doesn't it? LOVE it! The second is for my sister-in-law. She and my brother have this thing for Amy Winfrey and the Big Bunny Films. She’s got this shirt…with a squirrel. Well, he’s a homicidal squirrel but a squirrel all the same. Anyway, for some reason, it stuck with me and her Giant Coaster was born. Go look at the film-I outdid myself here. The resemblance is uncanny. 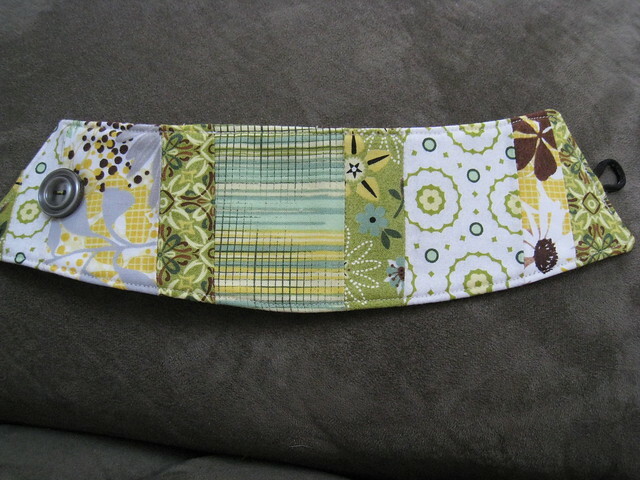 The third is for my swap partner in my wonderful Virtual Quilting Bee. She doesn’t know who she is yet. Ok, I’m sure she knows who she is but she doesn’t know who I am or that I made this for her. I’m hoping she’s slacking in her blog reading and won’t see this until after her Giant Coaster hits her doorstep! She wanted something with circles and bright colors. 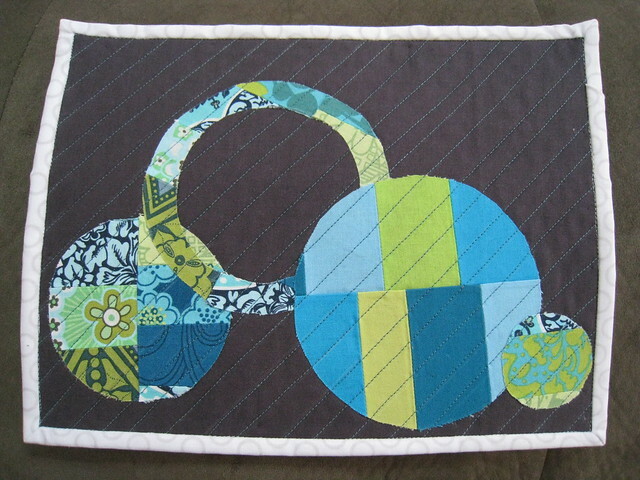 I love the patchworked circles and the way they stand out against the coal background. 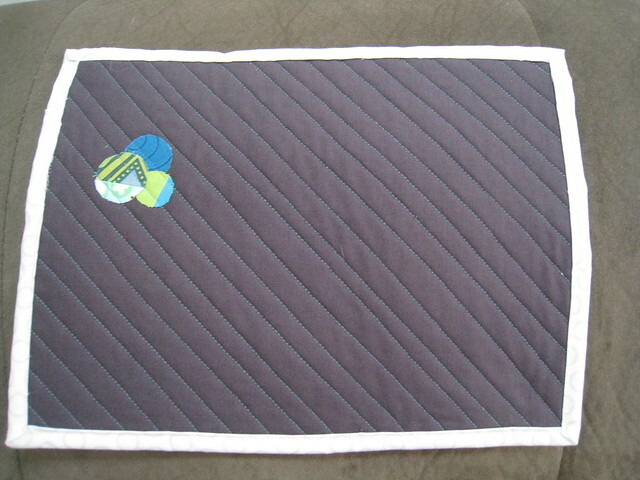 Even the binding has circles! On a separate, yet mug related note, my sister just started working part-time at a coffee shop. She’s kind of a seriously a coffee (and tea) addict so this is a great thing for her! 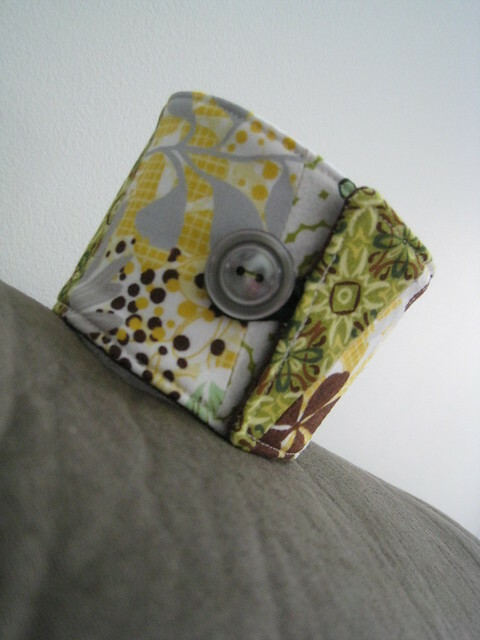 I used a combination of Terri’s and Erin’s tutorials and whipped her up a cute coffee cozy to match her purse! The Hubs picked out the button-awesome! Whew!! That’s all for today. I think I’m ALMOST at the end of my holiday sewing-just a few more pillowcases and perhaps another Giant Coaster or two. Happy Monday, ya’ll!! This entry was posted in Bees, embroidery, Family, Finished Projects 2010, Holidays, Swaps and tagged embroidery, finished projecs 2010, gifts, swaps, VQB. Bookmark the permalink. Terri’s giant coaster is super cool. (So is Terri–super cool, that is!). And I’m totally with ya on the “mug rug” thing. “Giant coasters” it is from now on. 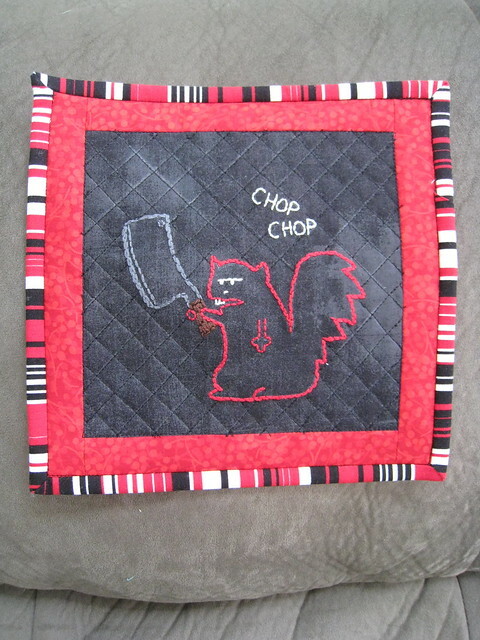 That homicidal squirrel is just too awesome! I think I forgot to type Thank You in my previous comment! Thank you! I can’t tell you how much I LOVE my new giant coaster! I really really really LOVE it! It’s just perfect for me. I was so surprised when I opened an unexpected package to find that adore Converse shoe with graffiti that screams “Terri” on it. I think the Breaking Benjamin part is the best – how cool! I have it hanging in my kitchen so I can see it throughout the day. Plan to blog about it this week too, so stop by in a couple days. Oh yea, I also love the other giant coasters you made! That squirrel is hilarious, and the circles kinda remind me of a crazy bicycle. Well done with these treasures and the matching coffee cozy (good idea to match it to her purse).